Usefull helper for the workbench! Ideal for Drill Stands MB 140/S and MB 200. Also for Bench Drill TBM 115. One set (two pieces) of step clamps are included. Table size 7 7/8" x 2 3/4" (200 x 70mm) with 3 longitudinal T-slots. Adjustable dials are graduated in 0.05 mm increments (1 revolution = 1.0mm, 1 pitch line = 0.05mm feed). An adjustable ruler facilitates positioning of the cross slide. Table size: 7 7/8" x 2 3/4" (200 x 70mm), with 3 T-slots in size 15/32" x 15/64" x 13/64" (12 x 6 x 5mm), distance from center-to-center 63/64" (25mm). X-travel 5 9/32" (134mm), Y-travel 1 13/16" (46mm). Overall height: 1 11/16" (43mm). Included in the compound table but can be ordered separately (2 step blocks and clamps, T-slot nuts of MICROMOT standard, bolts). 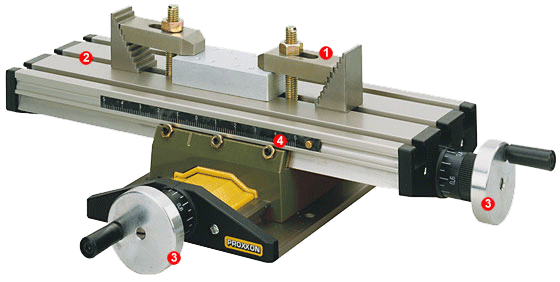 This set also fits the Mill/Lathe System PD 230/E and FF 230, secures objects to approx. 0.7". This dividing attachment has been especially designed for use with the MICRO Compound Table KT 70 which is identical to the X-Y table of the MICRO Mill MF 70. 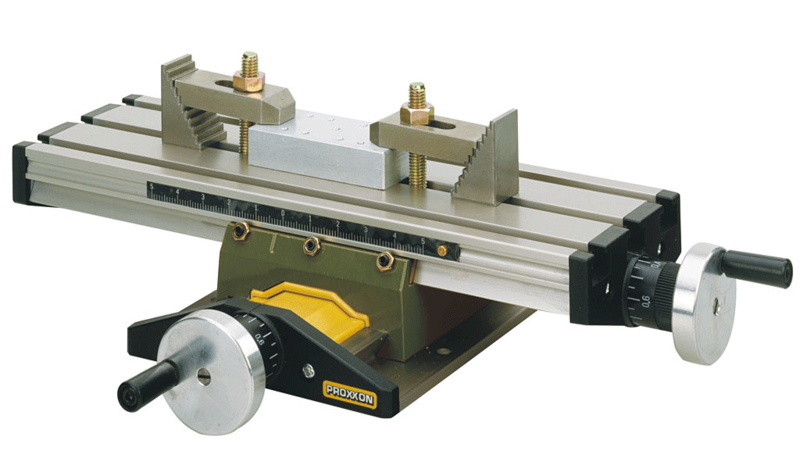 All provided fixing holes match the slot distance of the above items, so that it can be mounted in no time with the included clamping parts either standing or lying on the table. When using it standing upright, also long work pieces can be worked on, as they can be pushed through a hole provided in the base plate. In wooden box with sliding lid.